A little while ago yet another thread about spoilers on TL was made. The message was clear; the community wanted the option of being able to filter out content from games that have happened recently while still being able to access the community aspects of TL. In response to this we have just re-activated a spoiler free TL experience. Things are a little different to last time, so this post will introduce you to the feature and the stuff that's going to be hidden. Keep in mind that we'll be monitoring usage of the feature and listening to your feedback so that we can ensure we're meeting the needs of those wishing to use TL spoiler free. While I've posted this thread to SC2 general for visibility, this feature will be available to any thread on TL.net and may be expanded to other sites if there is demand. 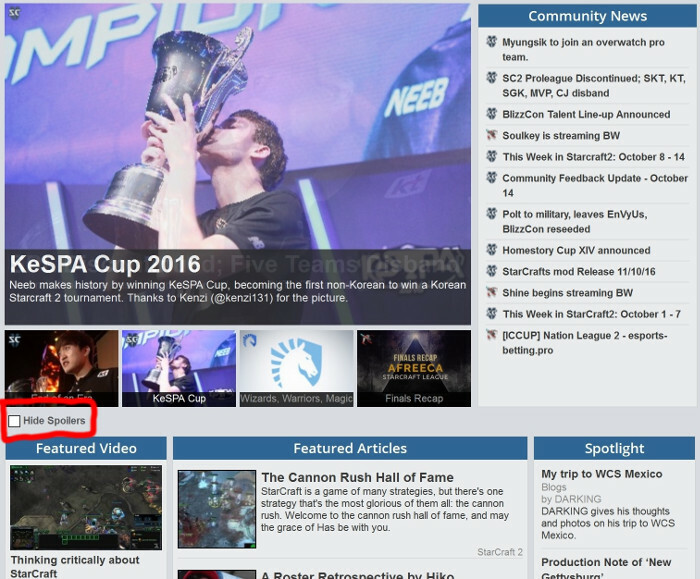 Spoiler-free TL can be enabled on the front page by checking the box under featured news. 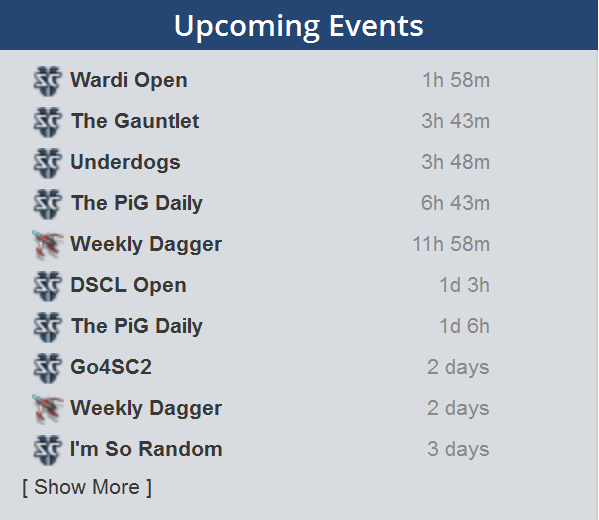 If you have forgotten to set your spoiler preferences (or can't remember whether you did) and you know there is an event going on visiting TL via http://www.teamliquid.net/nospoiler will automatically enable the spoiler free TL experience without getting yourself spoiled! You'll need cookies enabled for this tick to be remembered. Checking this box does a few things. 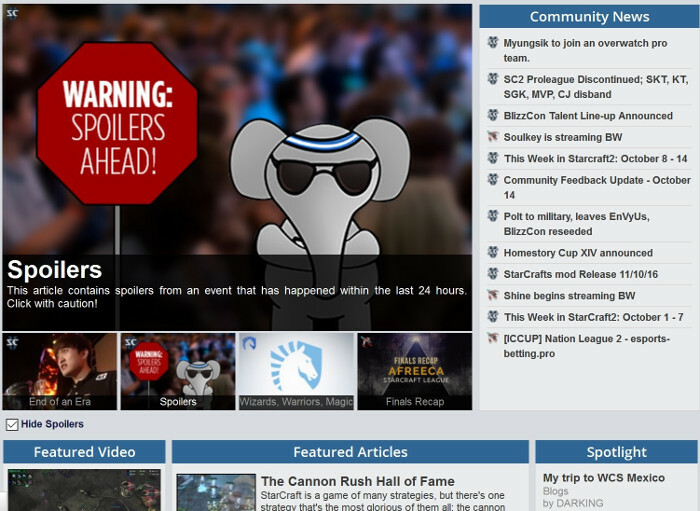 Articles which have spoilers and are in one of the featured article boxes will display the following generic image. Additionally, the title on the left side bar will be hidden in both the news section and the forum where the thread exists. They'll also be hidden if you're viewing from the forum and not the sidebar. Right now we've set threads to be spoilered for 24 hours. After this time the thread will automatically un-spoiler. 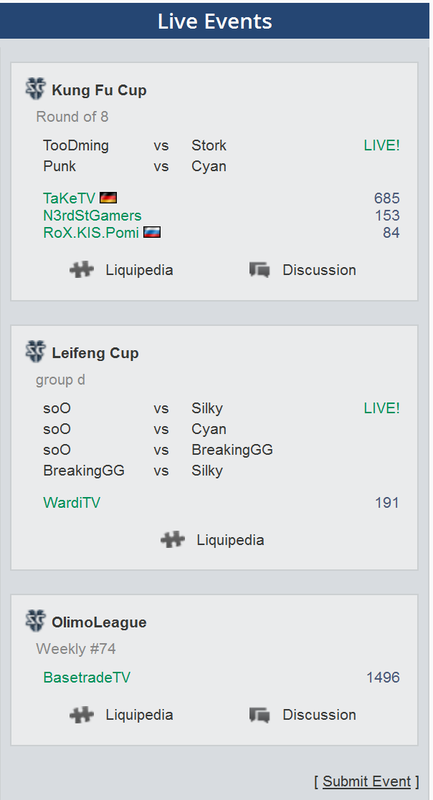 While in spoiler free TL the "who's playing" list in Live Events and Upcoming Events on the right side bar will also be hidden. We've even taken an extra step this time; any thread on the forums can be designated as having spoilers and have its title suppressed on the left sidebar exactly like we have done for news threads. 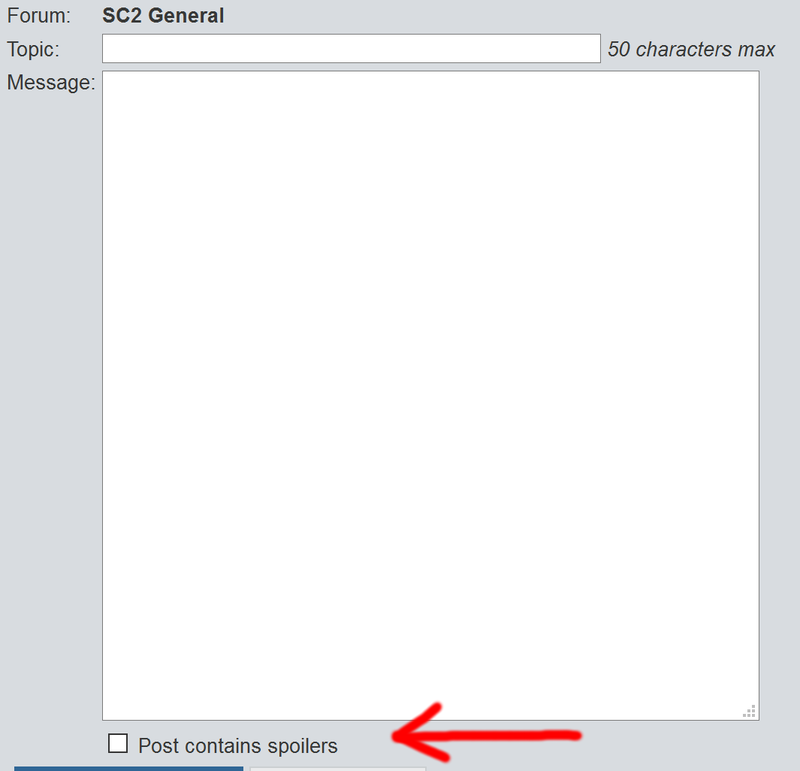 When creating a new thread there is a new box asking whether your post contains spoilers. If you check that box it won't appear in spoiler free TL. Moderators can also flag a thread as having spoilers in case someone forgets to correctly set the status (and feel free to use the report feature to bring it to our attention if we're slow!). Seeing as we won't really have any events until WCS Global Finals which might contain spoilers, I've gone and spoilered this thread. This means that once you activate spoiler free TL the title of this thread should appear as indicated above. As I mentioned earlier, we'll be monitoring how this feature is received over Blizzcon and may tweak the system here and there to best meet user needs. Very nice. I didn't expect this to be brought back so soon honestly, I thought it would take a bit longer. Good to see. Great system, thanks for creating it! That's great news! But at the moment the box is not "tickable". I click but it's not getting ticked. Is someone else having this issue?? I did promise it'd be back before Blizzcon! What browser are you using and do you have cookies enabled? EDIT: I see your response below, I'll get R1CH to look into it. I'm on Chrome and the checkbox works fine for me. Refresh if the box isn't clickable for you. Thank you guys so much for putting in this option. It really means a lot to me! Works correctly for me on firefox. Shameless plug: And for those of you curious about the Weekly Dagger as seen in the beautiful screen shots above, please watch tonight 9pm EST! Ok time to remember to press spoiler button! I use chrome and it works fine. However, if you mouseover [spoiler hidden], it does spoiler. Wonderful work guys. Really makes the writing staff's lives easier. We can't stop the browser from showing the URL regardless. Solution: Don't mouseover spoilers . I tried refreshing and also making sure that Chrome is up to date. Tried with without adblocker but the issue persists. What is funny is that on my virtual machine it's working with chrome (which has the exact same version and settings on Chrome as my physical one).... Which means that it's only on my physical one and not something which impacts everyone. Sorry for the hassle, I will continue to see if I can find the reason but you don't need to worry. Thank you for the assistance anyways and of course thank you for bringing back the spoiler free TL!! Do you have cookies enabled? Have you tried clearing your cache? You know, all those usual things? 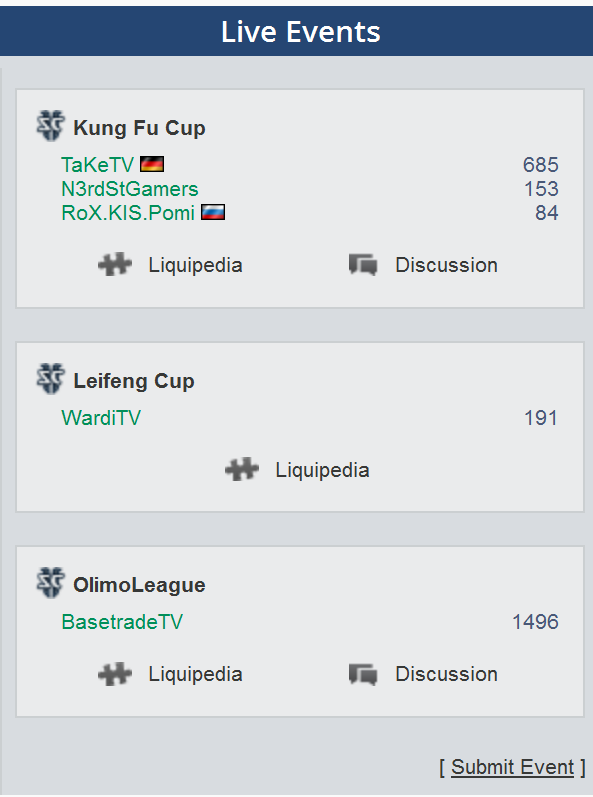 The good thing is that TL never spoiled Proleague results in the titles. Which means that doesn't decrease the effectiveness of the feature. At least not immediately. 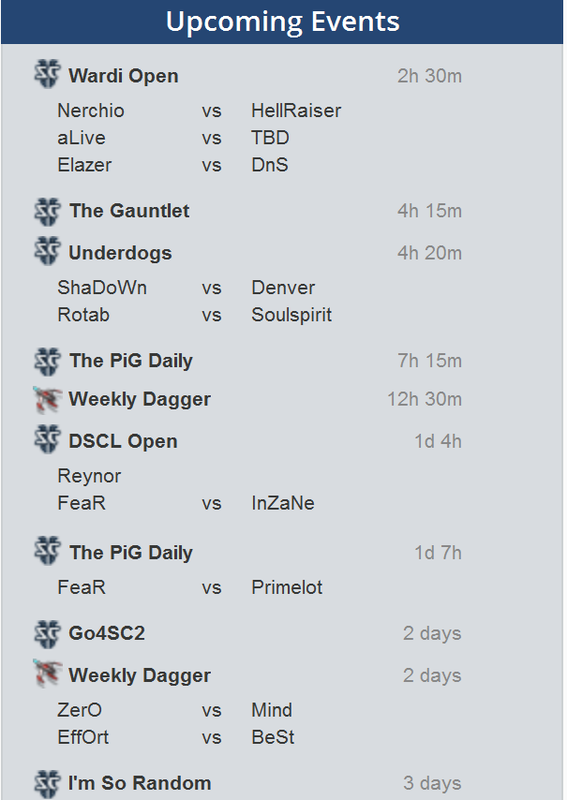 Can you also revert back the ProLeague news? I don't think R1CH has gotten around to adding time travel for TL mods yet.